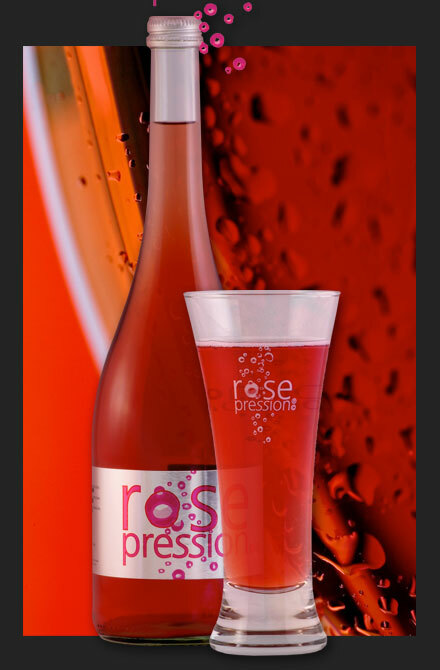 “Rose Pression ©®” is a sparkling rosé wine based aperitif, flavored with raspberry, giving it a pink color. “Blanc Pression ©®” is a sparkling white wine based aperitif, flavored with peach, giving it a pale yellow color. “Bleu Pression ©®” is a sparkling white wine based aperitif, flavored with curacao, giving it a blue color. Our original and innovative beverages are low in alcohol (only 6°). We wanted to develop easy to drink aperitifs for any moment or occasion. Gentle but not too sweet, our original beverages respond to the expectations of those who don’t like the bitter taste of beer, young people who like flavored and sparkling drinks or people who just want to try something different. Our drinks are thus an alternative to beer, soft drinks but also cava and champagne. Original and unique on the market, let yourself be tempted by this new sparkling and fruity flavors. Alcohol can damage your health, drink with moderation.